Read about Esther's Gragger in this great review from the CT Post! Brian Koonz took this photo when he interviewed me about Esther's Gragger for his article in the Connecticut Post. I guess you could say I have a split personality when it comes to my writing. I have published 5 books, some news articles, and numerous book reviews for librarians and teachers over the last 20 years. And now, I am a picture book author! You will find pages on my web site for both types of writing. I am also a children's librarian who is active in the American Library Association and I have a page for my professional activities, as well. Hopefully, there will be something of interest here for you to read - whoever you are! I remember desperately wanting to learn how to read when I was young, but it took me a while to figure out how to do it. When I was in third grade, I found Henry Huggins by Beverly Cleary, and that book turned me into a real reader! I read every Beverly Cleary book I could find and then moved on to other authors. I love children's books so much that I eventually became a children's librarian so I could keep reading kids' books, and then introduce them to boys and girls at the library. I started writing for fun when I was in eighth grade. I liked thinking up silly stories and inventing goofy character names. And I was always making up my own words to popular songs that I heard on the radio. This turned out to be a useful skill as a children’s librarian, because I have written lots of songs to use in storytimes. I grew up in New Bedford, Massachusetts. My parents owned a small store, Dotty’s Variety (named after my mother) which had a penny candy counter, back when you could actually buy Bazooka bubble gum and red licorice for a penny. My brother and I often helped out at the store during the 18 years that my parents owned it. 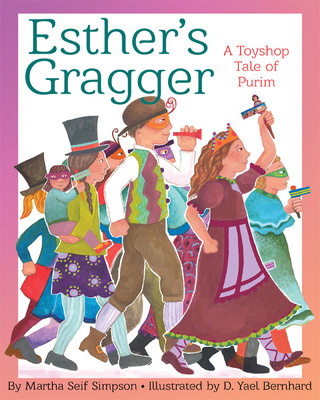 Perhaps I was thinking of the store when I wrote my first Toyshop book, The Dreidel That Wouldn’t Spin: A Toyshop Tale of Hanukkah, published in 2014 by Wisdom Tales, and my newest book, Esther's Gragger: A Toyshop Tale of Purim (2019). My husband, John, and I have two boys and two girls. My first picture book, What NOT to Get Your Mom on Mother’s Day is dedicated to my children - Paul, Rose, Nick, and Shayna, who are all grown up now. My daughters followed my career path and are also librarians. Although I have been writing children’s stories for several years, it took a long time for me to break into the children’s book market. Meanwhile, I went to library school and became Head of Children’s Services at the Stratford Library in Stratford, CT. I published several library resource books which you can read about on this web site. I enjoyed writing them, but now I want to focus on writing for kids. I will keep you updated on my progress!